New branding and new comms chief: Can the English Football League get fans onside? 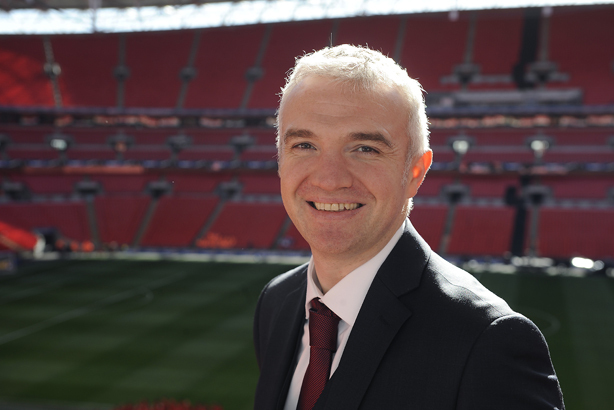 The English Football League's new director of comms Mark Rowan and marketing director Drew Barrand spoke to PRWeek about why the Football League has become the English Football League - and why they're not concerned about being overshadowed by the Olympics. The Football League – which comprises the three leagues of English football below the Premier League – has been rebranded the English Football League, as part of a comprehensive corporate and competition rebranding. The new title, effective for the start of the 2016/17 season, aims to showcase just what exactly the brand positioning of the EFL is. PRWeek met the EFL’s marketing director and its new comms boss at Fulham's stadium Craven Cottage ahead of the first Championship game of the season, Fulham v Newcastle, where representatives of all EFL clubs (spanning players, fans and club staff) assembled for a team photo. 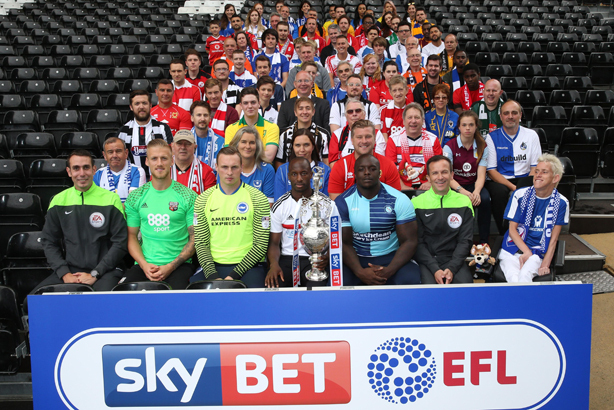 The event forms part of a wider narrative the EFL is hoping to develop over the course of the season – part of its #EFLStories campaign to demonstrate that the EFL offers a football experience for everyone. This is to an extent comparable to the Premier League's recently announced plans to put player and fan experience more at the forefront of its brand. "There are lots of proactive things we will do over the next 12 months shining a light on fan stories and giving them opportunities to have their say – to tell us what’s so great about their club and what’s been so beneficial to their local community," said Drew Barrand, the EFL’s marketing director. "EFLStories will tell those things, because there’s no greater credible voice for our brand than it coming out of the mouths of people who form part of our community." Various content captured at the launch will be released over the first few weeks of the season and the theme will be continued over the next few months, producing more content. "There’ll be other spike moments we have, especially at the end of the season when we get into Wembley and finals, promoting specific events, but it [EFLStories] will always be there in the background as a consistent reference to that central brand narrative we want to portray," said Barrand. The rebrand itself was necessary for a variety of reasons. "We need to give ourselves an identity," said Mark Rowan, who joined the EFL as its comms director in May. "There’s a misconception about the role of the EFL and what it does – some people think it’s the FA or the Premier League. It encompasses the Championship, League One and League Two, with 72 clubs in total. We really need to define what the identity is because it impacts on every single fan of those 72 clubs." Starting in September last year, the league has undertaken its biggest stakeholder research project to date (incorporating fans, clubs, broadcast and commercial partners, as well as international fans and businesses) to find out what people think of the league. This revealed both a strength and a challenge for the brand. "It’s quite difficult to find that golden thread that goes through everything," said Barrand. "72 clubs across 72 different towns and cities with all different sizes of fanbases and demographics of audience all coming together around a single product. It was that diversity of the offering that was the golden thread we ended up hanging the brand positioning around. "I didn’t set off at the start of this to change the name of the oldest sports property in the world – that would have been career suicide," Barrand (pictured below at Wembley) joked. "But it turned out that the words ‘the Football League’ were about as generic as you're going to get." It was not clear to the uninitiated what league it was, and indeed whether it was American or English football. This was seen as a crucial issue when one of the goals was to develop the EFL’s standing in the global market. There was an initial burst of criticism when the new logo was released, but Barrand stressed there was no negative feedback from the clubs when it came to the new name. "We presented the idea to clubs a good two months before it saw the light of day to the outside world and when you sit down and explain the strategy and issues of the old Football League, it was actually very obvious that a name change was exactly what needed to happen," he said. "People on social saying ‘Oh, well there are Welsh clubs in it', the reality is those Welsh clubs have played in the league for the past 100-odd years." One of the big comms challenges will be galvanising the huge fanbase of these 72 clubs. Some 16 million fans go through the turnstiles each year. "They’re not fans of the league, they’re fans of their clubs and what we want them to do as a result of being fans of their clubs is have a good feeling about the league and the competitions their clubs play in," Barrand pointed out. "We can use that collective mass to generate more revenue to help clubs grow and become more successful, so there’s a definitive circle of activity there." In the past the EFL predominantly relied on broadcast and sponsorship partners to tell the story. "Naturally what happens is that they tell their story and we become a part of that narrative, as opposed to us being able to define our own brand," Barrand said. "That’s increasing important; if you look at the way sports is going there’s certainly a bit of a gap emerging from a commercial revenue perspective between the really big sports properties that are globally successful and those that have a slightly lesser audience." In June, research from Deloitte said hefty TV deals are boosting Premier League clubs into "a new era of sustained financial performance", as clubs generated £3.3bn record revenues in 2014-15, an increase of three per cent. The 92 clubs across the Premier League and the EFL generated more than £4bn in revenues for the first time in the same period, a new record. "We have to be realistic – we’re not the Premier League, we sit firmly in that second camp, but that doesn’t meant we’re not valid and credible and don’t have a good story to tell about our numbers," Barrand added. A key part of the strategy was the hiring of Mark Rowan as comms director. He has worked in football since the 1990s and previously served as head of media at Everton FC. Rowan said it wass almost an historic issue in football that "any time you heard from a club or the EFL, something bad had tended to have happened and it was all very reactive". He said the comms work would become more proactive "and almost fall into line with modern corporate communications", pushing positive messaging across a variety of channels. Before Rowan arrived, there was not a dedicated PR team so the EFL is now looking to build the team "I have absolutely no criticism of what was being done beforehand; it just needed to be done differently," Rowan said. "It can be a bit difficult because the message at times can be quite corporate and quite dry. It’s about maybe softening it up and putting a bit of fun into it." And as for the tight timings – the Fulham v Newcastle game is on 5 August; the Olympics opening ceremony is on 6 August – Barrand shrugged it off as part and parcel of modern sport. "The sporting calendar is so compressed these days that there is no good week where something isn’t going on," he acknowledged. "So you just have to be aware of it. We go live at the point when the fixture calendar dictates that we do. Yes the Olympics is happening in the first week and that’s obviously a massive story across sport, but football fans are football fans." The audience, as he pointed out, is there: "It’s about defining the brand to them and making sure they feel proud their club is taking part in the league competition."